We’re excited to announce our new website! Every ‘brick and mortar’ store, aims to stay trendy and welcoming. The same story applies to your online site. With the new website, we hoped to improve our look and feel and the user experience. In the planning phase, we decided to rebrand ourselves to better match our culture and values, switching our imagery to people working together. We wanted our website to reflect the emphasis we put on relationships rather than just being innovative or dynamic. We care about you – our client – and we’re doing our best to give you clear assessable information about us and a clear path to the services we offer. You can enjoy a modern look and an enhanced user interface. A better user experience was our chief goal in updating our website. Tailoring the site’s navigation and structure we reduced the number of pages from 30+ to less than 15, simplifying content to increase readability. We reduced the number of clicks it took to assess content – making finding information quicker and easier. 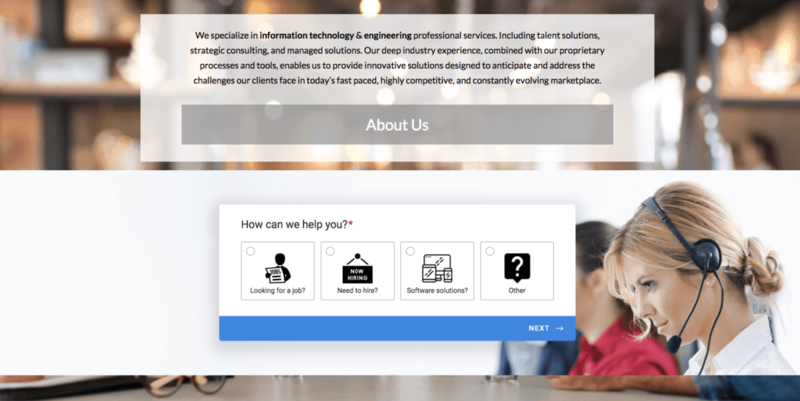 We included CTAs (call to action) on almost every page to engage visitors through forms by obtaining contact info, resumes, or project/staff inquiries. Before, our visitors had trouble finding the page where we listed open jobs. So, we condensed the jobs from four pages to one and renamed the page to open jobs instead of hot jobs. This increased page views more than 75%. View our open jobs. As part of enhancing the user experience, we reworked images, layout, and content to create a friendly mobile experience. What do you think about our redesigned website? Feel free to email us with your feedback.